What is your BDL™ ? What is your Billion Dollar Level? Just like you take a test to find out your cholesterol level of HDL and LDL, you can now compare notes with other agents and identify with each other by your BDL. You must honestly face the reality of your current business. You must determine which Billion Dollar Agent Level you are currently at, and set written goals to achieve higher levels by specific dates. There are 7 levels. You must first survive. You can then achieve stability, create a solid profit, build a successful business, and become a Billion Dollar Agent. Some of the following descriptions are written, without quotes, from the perspective of a real estate agent at that specific level. You may find the next few pages stressful, gut-wrenching, insightful, inspirational, and practical — all at the same time. Maybe I will try real estate. Maybe I will dabble in real estate. Maybe I will think about it for a few more years. Maybe I will work part-time in real estate. Maybe I will get my license, get a job at a local franchise, and try to sell real estate. Maybe real estate is not such a good idea. Maybe real estate is not for me. Maybe the market is too soft to make sales right now. Maybe I don’t like all the stuff you have to do to be a real estate agent. Maybe I did not know, that when I got a job at this firm, my pay would actually be $0. Maybe I did not know that besides getting a job that paid $0, I actually had to pay a few thousand dollars to maybe sell real estate. Maybe this isn’t for me anymore. About 30% of real estate agents are either coming or going from the industry all the time. If you are a Maybe One, decide right now whether you are still a Maybe or that you will do what it takes to get to Just Me Three. If you are unsure, you are a Maybe and may close this page right now. I was making about $50,000 salary in my prior job and I heard that most real estate agents make more than $100,000. It sounds like an easy job and you make a lot of money. Plus, the work time is flexible because I would be working for myself. I didn’t know anything about marketing and sales. I didn’t know that the key to success in real estate is marketing and sales. I didn’t know that when I sold a house to someone, I actually only got 3% instead of 6% commission. I didn’t know that of the 3% commission, my broker keeps about 50% of it so I really get about 1.5%. I didn’t know about estimated taxes and that I was supposed to set aside a percentage of my commission check in a separate bank account and submit estimated tax payments to Uncle Sam. I didn’t know I was supposed to have a budget. I didn’t know that I was supposed to have a marketing plan and business plan. I didn’t know that when a friend, who is a real estate agent that I know, told me that she ‘makes $100,000/year’ that she was referring to her gross commission income and not the net profit of her business. I didn’t know that she really makes about $60,000/year. I didn’t know that my new job at the real estate company does not include health insurance and I have to pay another $5,000-$10,000/year to cover my family. I didn’t know, and that is why I failed in real estate, and I have decided to leave the job after I tried it for a few years. About 30% of real estate agents actually try to make it for a few years, on a full-time basis. But, they never match their previous job salary equivalent, they acquire more debt, and they suffer through a terrible two years before failing and quitting. It is just me in my real estate business; but, I am surviving. It is much harder than I had thought. More than 50% of the other agents who started with me 2-3 years ago have failed and left our company. I am happy to be surviving. I made about $40,000 a year in my previous job and I think I am doing about the same in real estate. I had about $60,000 GCI and I think my net profit was about $40,000. Of course I am a bit unsure about this, because I think I spend a few thousand dollars more for my car and gasoline. I don’t even know if that is considered an expense. Also, I had four weeks vacation in my last job; I have not taken a one week vacation in the last three years in real estate. But, I am pretty happy and proud to be self-employed and surviving. I guess I do not really have a business yet. But, I feel it is better than my old job, and I do have some flexibility in my hours. If you want to survive in real estate, you must have a strong sales personality, and desire to find prospects, and close sales. One good option is to join an existing top team to learn from other agents. If you do not have sales skills and do not want to join a team, you should seriously consider exiting the real estate business and seeking a J-O-B. About 20% of real estate agents are surviving, barely, and have created a job for themselves as a self-employed person. I am finally at a stable point of my real estate job. It was a really hard first few years, but I can feel all the pieces coming together, and I have more confidence. Last year, I had $100,000 GCI and I had a net profit of $65,000. I am proud that I had goals, a budget, and a business plan for last year. I think that is why my net income went up 40%. Best of all, I finally paid off my last credit card debt and I am now saving 10% of my net profit, or about $500/month, into a retirement plan. My current problem is that I am getting busier. This is a good and bad thing. Now I am working about 60 hours per week and it does not seem enough. My eating habits are terrible, I have gained 20 pounds. I do not find or take the time to exercise and workout like I used to at my old job. Worst of all, my spouse has been complaining that I work all the time, and my children don’t even try to ask me to do family things together on the weekend like we used to. I feel stressed and out of balance in my life. 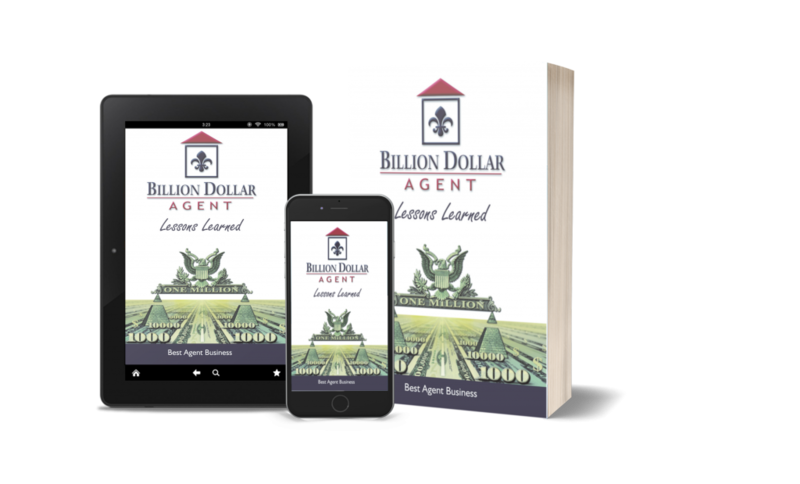 I read Billion Dollar Agent – Lessons Learned and I think that I only spend about 20% of my time using my unique talents. I have been thinking that I need an assistant and should hire a part-time assistant or do something. About 10% of all real estate agents are at this level. My business and life are solid, and getting better every year. I am very happy that I am a real estate agent, and I can see a fantastic future. Last year, I had a net profit of over $100,000. I hired a part-time assistant which helped me leverage my time. Now I can do more of the work that I enjoy and makes me money. The assistant is getting work done that was just never getting done. I can see the benefits of my client marketing efforts as over 50% of my business is now client repeat/referral. This has led to greater profits. I have my goals that I read daily. I review my budget monthly. I am developing a financial plan for the future. Best of all, I am spending about 30-40% of my time using my unique talents and loving every minute of it. I set my goal to get to the next level within 2 years. About 10% of real estate agents are at this level. My business is very successful. I have a net profit of over $200,000 each year and save/invest 20% of my net profits. I am building my business and team by delegating to assistants and leveraging my time in all possible ways. Soon,I will be exploring getting my first buyer agent as I focus solely on listings. My life is in excellent balance. I am accomplishing a variety of life goals. I spend over 50% of my time using my unique talents. About 1% of real estate agents are at this level. I made it after a decade of hard work and smart work. A few years ago, my business passed $1,000,000 in revenue for the first time. And this past year, I achieved the Zen Seven level of $1,000,000 net profit. We have consistently lived below our means and saved for retirement. Right now, my plan is that with further growth of business, I should be able to retire, if I wanted to, within another 10 years when I am 55 years old. I spend more and more of my time using my unique talents. I can see a future where I can reach a level of significance and contribute to other people in many ways. I have been mentoring and helping other agents for the last few years and sharing my knowledge. My business helps to support a few different community charities. I enjoy that work, we make a difference, and it is good marketing for our business as well. About 1 in 1,000 agents achieve this level.